Actor couple Vatsal Sheth and Ishita Dutta are on vacation in Paris and when visiting the Eiffel Tower a romantic picture is a must. Vatsal shared the picture with several hashtags - the first one said, "No caption needed." 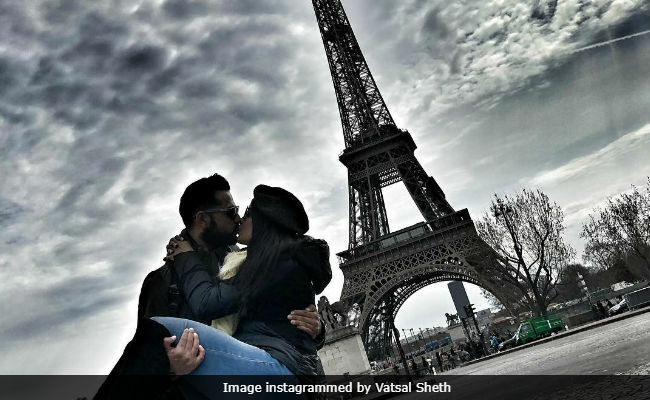 In the photo, Vatsal Sheth has scooped Ishita in his arms as they kissed against a dramatic backdrop and the Eiffel Tower. The photograph was reposted by Ishita on her Instagram account and collectively it has over 50,000 likes. "Adorable couple," read one comment. Vatsal and Ishita, who got married in November last year, were in Amsterdam before Paris. In Paris, Vatsal and Ishita also met Ajay Devgn and Kajol and their children Nysa and Yug. Ajay Devgn played Vatsal's onscreen father in tarzan: The Wonder Car and Ishita's onscreen father in Drishyam. Vatsal Sheth became a household name after starring in popular television series Just Mohabbat from 1996 to 2000. He debuted in Bollywood in Taarzan: The Wonder Car and went on to star in films such as Paying Guests and Heroes. Vatsal Sheth returned to television in a negative role in Ek Hasina Thi. He was last seen on the small screen in Haasil, co-starring Zayed Khan. Ishita is the sister of former actress Tanushree Dutta and she too stated her career in acting on the small screen. Her first show was Ek Ghar Banaunga. She co-starred with Vatsal in Rishton Ka Saudagar - Baazigar. She was last seen on the big screen in Kapil Sharma's Firangi.